Cody Glass wanted to be starting his NHL career this season. But the 19-year-old Portland Winterhawks forward is embracing the opportunity to lead a team that includes skilled players starting their Western Hockey League journey. 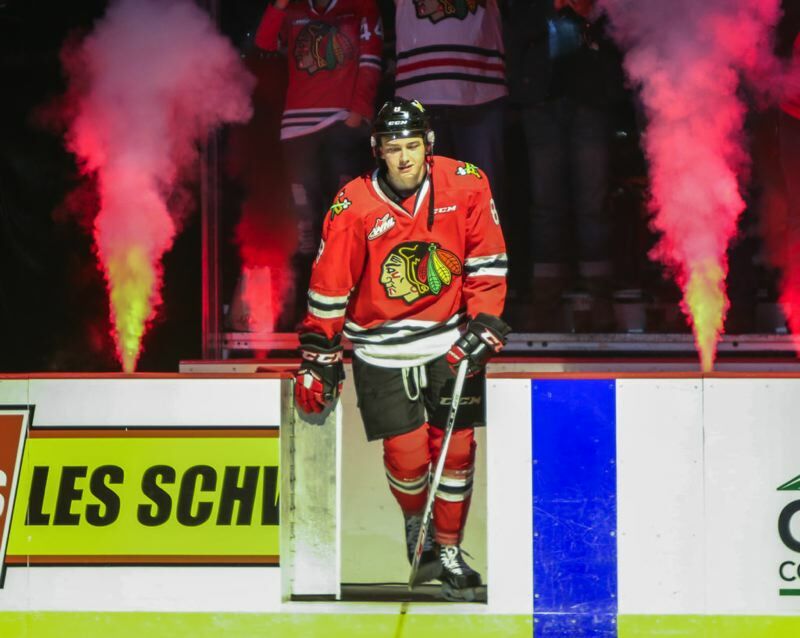 Named the 43rd team captain for the Winterhawks at the start of this season, Glass is off to a fast start in his fourth season with Portland. Listed at 6-2 and 185 pounds, Glass has 32 assists and seven goals in 19 games. His career totals 86 goals and 176 assists for 262 points in 220 WHL regular-season games. Going into Winterhawks home games Wednesday, Saturday and Sunday, Glass was leading the WHL in assists per game (1.69) and one of three players averaging more than two points a game. Glass is honored to be the Winterhawks' captain. "A lot of good players have come through the organization and been captain, and I'm proud that I get to represent this team to the fullest." Winterhawks VP/GM/coach Mike Johnston says Glass was named captain as much for his off-ice work as for his skill on the ice, where he is a key player in all phases of the game. "We have a lot of candidates for leadership in our group, but certainly he's a guy that stands out," Johnston says. "Over the years, he's led by example. On the ice he's a great player, but off the ice he's a leader within the dressing room, within our team." More of a quiet leader than a ranter, Glass says he will lead by example and do his part to ease the transition to the WHL for the nine rookie skaters — including three 16-year-olds — on the Portland roster. "We have a really young team this year. The biggest thing I tell them is (have) confidence. If you can start with your confidence (high) at an early age, when you become 17, 18 it's going to be a lot easier," Glass says. "That's something I never really worked on when I was 16 — being more consistent, being more confident." Glass had 10 goals and 17 assists in his 16-year-old rookie season with Portland. Since then, he has produced 73 regular-season goals and 143 assists. When Glass arrived in Portland from Winnipeg in fall 2015, then-captain Dominic Turgeon was a "huge, huge help in my development. "He was one of the nicest guys I ever met. I remember him taking me aside after practice and helping me work on face-offs and stuff like that," Glass says. "Having a guy like that my first year really helped me develop into the player I am." Glass remembers confidence being a big challenge entering the WHL at 16. He is encouraging players such as 16-year-old Seth Jarvis, Cross Hanus and Robbie Fromm-Delorme to play without fear. "That's something I worried about. If I made a mistake I'd think I'd be benched next shift," Glass recalls. "But Mike's good. He does a good job of letting you play your game, and if you make a mistake he's going to put you right back out there. He'd rather you take a chance than not do it, so that's something I really like about Mike, and it gives you confidence as a player." Glass — the first draft pick in Vegas Knights history when he was selected with sixth in the 2017 NHL draft — says he was confident at his second training camp with the NHL club. A lower-body injury kept him out of the lineup for a couple of preseason games and hampered his chances of breaking into the roster. "Being injured is a terrible feeling. You want to be out there. Wanting to play through the injury was hard," Glass says. "I just wanted to play as much as I could to earn a spot on the team." The next team Glass wants to make — and figures to — is Team Canada for the annual World Juniors Championships. That 10-team event happens Dec. 26 to Jan. 5 in Vancouver and Victoria, British Columbia. It was a surprise when Glass did not make Team Canada a year ago, so he figures to be extra motivated to make the most of this opportunity. Glass recently joined other top Western Hockey League players on Team WHL for two games in the annual junior hockey Canada-Russia Series. That event is an early scouting opportunity for selecting players for the World Juniors. Glass played well as Team WHL and Team Russia split two low-scoring games. He was chosen first star of the Team WHL win on Nov. 5 and said he enjoyed the opportunity to play alongside guys he has played against during his WHL career. There was one scary moment late in the first game against Russia when Glass crashed into the end boards at high speed. "I think I might have stepped on a stick," he recalls. "It's kind of a scary moment going that fast into the boards but luckily I'm okay." Glass was in Las Vegas during the Knights' run to the 2018 Stanley Cup Finals; he was skating with other prospects. Though he didn't spend much time around the team, he got a sense of the intensity and toughness required at the pinnacle of playoff hockey. To prepare for this year's NHL training camp, and for his 19-year-old season, Glass focused on improving his nutrition. He also spent a month training alongside NHL players at the Gary Roberts High Performance Training in Toronto. "I really loved being there, getting to train with the pros. It was a real good experience, just learning how to eat healthy and train like a pro," he says. He came away with stronger legs and better eating habits. And he continued his growth with a solid training camp with the Knights. "I knew what to expect and played with a lot of confidence. I thought I did really well while I was up there," Glass says. "I didn't stick long enough. Obviously I'm disappointed in myself about that. But I'm just going to keep pushing for next year." Glass and Joachim Blichfeld — another Winterhawks veteran who wanted to be playing pro hockey this season — have been a dynamic pair early in this season, their first as linemates. Blichfeld, a 20-year-old San Jose Sharks' prospect from Denmark, led the WHL through last weekend with 20 goals in 22 games. "We have good chemistry together. We're very talkative with each other and we live together so I see a lot of him," Glass says of the partnership with Blichfeld. "We know aspects of each other's game and know where we're going to be so I think the chemistry's there. Obviously, he's a shooter not a passer but he's a very heads-up guy and we play well together." For the Winterhawks and their fans, the prospect of a motivated Glass leading the way is exciting. As captain, he intends to let his play do the talking. "I always want to win. I want it bad," Glass says. " I want to be that player on the ice that when people see how bad I want (to win), they're going to want it just as bad as I do."